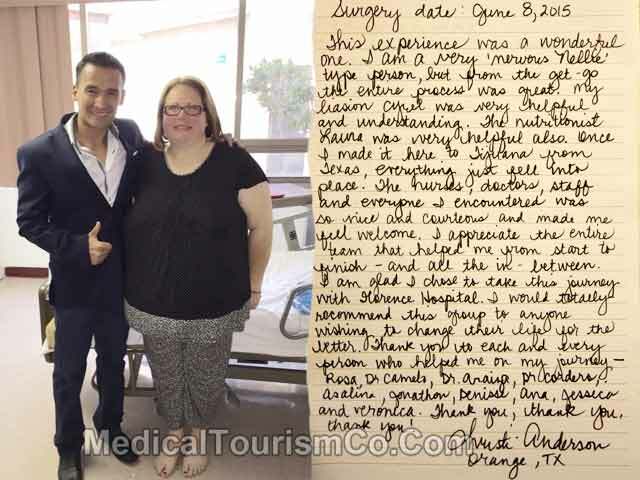 Here is the written review of Christi Anderson, an Orange – Texas resident who talks about her gastric sleeve experience in Tijuana, Mexico. In her vertical sleeve testimonial, a self-proclaimed ‘nervous Nellie’ Christi says right from the word go her experience was great. This experience was a wonderful one. I am a very ‘nervous Nellie’ type person, but from the get-go the entire process was great. My liaison Cyrel was very helpful and understanding. The nutritionist Laura was very helpful also. Once I made it here to Tijuana from Texas, everything just fell into place. The nurses, doctors, staff and everyone I encountered was so nice and courteous and made me feel welcome. “I appreciate the entire team that helped me from the start to finish – and all the in-between. I am glad I chose to take this journey with Florence Hospital. I would totally recommend this group to anyone wishing to change their life for the better. Thank you to each and every person who helped me on my journey – Rosa, Dr. Camelo, Dr. Araiza, Dr. Corders, Asalina, Gonathon, Denise, Ana, Jessica, and Veronica. Thank you, thank you, thank you! The Mexican medical tourism hub of Tijuana is suitably located just about 17 miles from San Diego. The availability of world-class bariatric surgery for a fraction of US prices just a few miles from California makes Tijuana an apt destination for medical tourists.